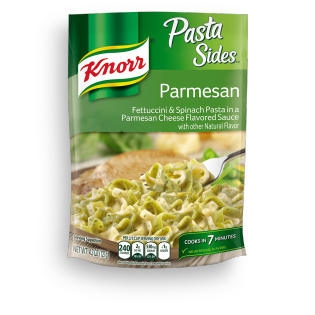 Parmesan Pasta is rated 2.9 out of 5 by 19. Rated 5 out of 5 by pjr7269 from healthy meal i just made the parmesan pasta recipe that was on the bag of the package. OMG my girlfiend and i loved it! we work second shift and while everyone is always eating garbage food we always bring a quick n decent meal in tupperware prepared ahead of time. this recipe was sooo tasty, so easy to accomplish yet very healthy. i used frozen grilled chicken, can of artichokes, light sour cream and reduced fat cheddar jack shredded cheese with frozen chopped spinach, 2% milk, and yogurt butter. absolutely outstanding. thank you KNORRS people! Rated 3 out of 5 by busymommy from Great in a pinch! I have been eating your sides for years, because they are a effortless and quick. However, I can't help but notice that the flavor has been on a steady decline. I use to cook them as directed and really enjoyed them. Now, I have to add salt, pepper, and extra parmesan for this particular side. Please bring back that great Knorr flavor that I grew to love. Rated 1 out of 5 by janmga from take the old pic and description off the website I CAME TO YOUR WEBSITE AND FOUND THE PARMESAN FLAVOR PICTURED AND DESCRIBED WITH THE SPINACH NOODLES. I FOLLOWED THE LINK AND ORDERED FROM AMAZON AND RECEIVED THE "NEW" VERSION. IF YOU ARE NO LONGER MAKING THE SPINACH NOODLES PLEASE REMOVE FROM THE WEBSITE - MY SON DOESN'T CARE FOR THE NEW VERSION AND NOW I WASTED QUITE A BIT OF MONEY ON NOODLES FOR NO OTHER REASON THAN YOU KEEPING A PRODUCT THAT IS NO LONGER AVAILABLE ON THE WEBSITE. Rated 2 out of 5 by Mbooks22 from Miss the old recipe Not the same. Different noodles, not as cheesy. Makes me very sad. Compared packaging/ingredients from old and new version, definite changes.